Premium-PLUS quality bath mats size 20x34 weight 9Lbs/doz. High end for Hotels and Resorts.These bath mats are thick and absorbent at wholesale price. Bright white and long lasting. When you step into the shower, you’re expecting a relaxing experience where you can unwind with utter bliss. When you step out of the shower, you expect to receive the same level of comfort. Make sure every moment in your bathroom is luxurious and comforting by investing in our wholesale premium white bath towels with added softness, durability and style. When you find yourself in search of the perfect bath mat for your home or business, you may be stuck debating which color best suits your rooms and surroundings. Fret no more — our white bath mats are the perfect choice! White is a chic color that complements any preexisting color scheme or décor. Whether your business has a vibrant color scheme or your décor is neutral and basic, white enhances any surroundings without detracting from the current style in place. If remodeling or new interior is in your company’s future, these white bath mats provide everlasting style no matter where they're displayed. Strength and Sturdiness: No towel gets a workout quite like bath mat towels. Bath mats receive constant use after being stepped on day in and day out. While they inarguably receive their fair share of use, that doesn’t mean they have to show it! Our premium bath mats are 100% cotton, meaning they retain their shape and size without tearing or fraying even after constant usage. Impeccable Shine: It's a no-brainer that a refined business needs equally stylish accessories to maintain its image. Our bath towels will amaze you with their snowy-white aesthetic. Dirt and residue is no match for the cleansing properties of 100% cotton fibers, which flawlessly retract stains and leave only pure, glistening whiteness behind. Gentle Smoothness: When you need fabric you can wrap yourself in with snuggly smoothness, cotton is your number one choice. While you might not be hugging your premium bath mat towels, your feet will enjoy the soft and indulgent properties of 100% cotton fibers every time you step into — or out of — the shower. Fast-Drying Fibers: Cotton is a fiber treasured for its superabsorbent properties. What good would a bath mat be if it didn't soak up any excess water or moisture? Our wholesale premium white bath mats will amaze you with how quickly they dry after use. Don't settle for subpar products that leave your feet feeling damp and moist — invest in our fast-drying cotton towels instead! There’s nothing more dreadful than running out of the bath mats your business needs to run efficiently. 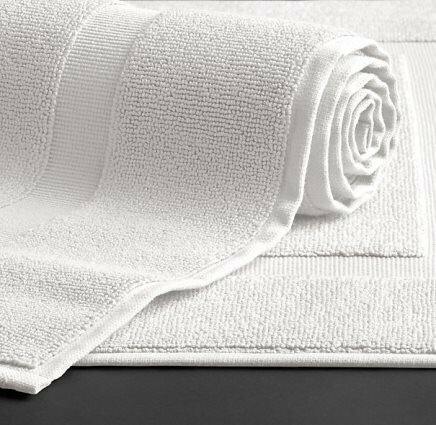 At Towel Super Center, we know how important it is to always have a fresh set of towels and bath mats on hand throughout the day. We’re proud to offer our customers the convenience of superior, top-quality products at a wholesale value. With deals this good, why not stock up on the towels your business deserves? Place your order online today for fast, hassle-free delivery straight from our facility to yours.